Uses For pronounced varicose veins, and tired, aching legs. JOBST - the No. 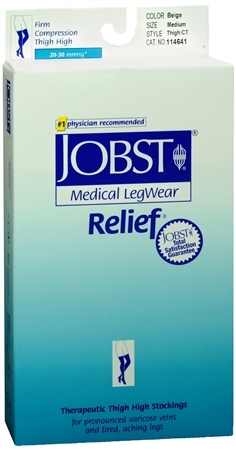 1 physician recommended brand of compression hosiery for over 50 years. Relief is ideal for patients who prefer: a generous toe area; a wide, smooth band for a comfortable fit that does not slip; a reinforced heel pocket for durability; a soft, smooth texture; hosiery that is easy to put on. Medium: b- 8 3/8 - 9 7/8 inches (21-25cm), c- 11 7/8 - 16 1/2 inches (30-42cm), g- 18 1/4 - 27 1/2 inches (46-70cm).